Warragamba Dam and Lake Burragorang is one of the largest domestic water supply storages in the world. Warragamba Dam was originally designed and built to withstand floods with an estimated 1 in 1,000 chance of occurring in any one year, i.e. a 1:1,000 Annual Exceedance Probability (AEP), estimated at the time of dam design and construction. For context, the largest recorded flood in the Hawkesbury-Nepean River in 1867 had an estimated 1:100 AEP. In the years post dam construction, the methods for estimating the magnitude of rare rainfall and flood events improved. Furthermore the regulatory flood capacity requirements for major dams were defined under the NSW Dams Safety Act 1978. In 1985, Sydney Water and a panel of Australian and international dam safety experts found that Warragamba Dam could not safely pass the adopted design flood for the structure – the Probable Maximum Flood (PMF). This is the maximum flood event that could occur over the dam catchment. The review at this time found that in the event this flood event occurred, the dam crest would be overtopped causing instability of the structure, ultimately resulting in dam failure and an uncontrolled release of the dam storage. 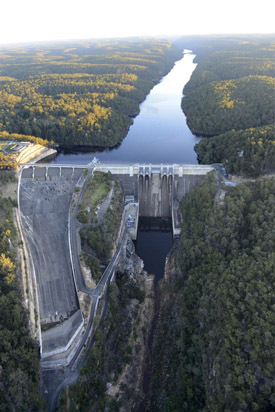 As with all dams in WaterNSW’s portfolio, Warragamba Dam must satisfy the requirements of the NSW Dams Safety Committee, the State’s dam safety regulator. The safety of the dam is not only important given the potential risk dam failure poses to persons, property and the environment downstream of the dam; but also because the dam provides approximately 80% of Sydney’s drinking water supply. Major (long term) works to bring the dam spillway capacity up to 100% of PMF. The interim works involved raising the dam crest by five metres and strengthening the dam and training walls by installing post-tensioned anchors. Additional dam foundation drainage and spillway apron slab anchorage works were also undertaken. This work, completed between 1987 to 1989, increased the dam’s flood capacity to 75% PMF (estimated at that time). Excavation of the auxiliary spillway on the dam right (looking downstream) abutment. Construction of the lined auxiliary spillway channel and training walls. Construction of the five auxiliary spillway fuse plug embankments, the divider walls between and the bridge over the auxiliary spillway. Installation of more post tensioned anchors in the training walls. Additional anchorage of the stilling basin apron slabs. Construction of deflector walls on the training walls at spillway gate arm level. Construction of the guard house protection wall. Additional dam foundation drainage holes. The major upgrade works, including construction of the auxiliary spillway, increased Warragamba Dam’s flood capacity to 100% PMF (note estimate of PMF at the time of the construction works). Warragamba Dam's existing crest gates and central spillway continue to manage normal discharge of floodwaters, up to around a 1:750 AEP flood event. In the event of an extreme flood, five erodible earth and rockfill embankments called 'fuse plugs', constructed across the upstream crest of the auxiliary spillway, would progressively wash away (or ‘trigger’) when overtopped by the rising floodwaters. The fuse plugs are approximately 14m high and the crests are set at different levels so the embankments trigger at different flood levels. As each fuse plug progressively washes away, the capacity of the auxiliary spillway increases to pass the incoming floodwaters. The downstream end of the auxiliary spillway chute has a ‘flip bucket’ structure which dissipates the energy from the flood discharges flowing through the spillway, prior to flow entering the river channel downstream of the dam. This minimises erosion of the riverbed and banks. Construction of the auxiliary spillway involved excavating 2.2 million cubic metres of rock from around the right abutment side of the dam. This created the 700m long channel; 190m wide at the upstream end, and 65m wide at the downstream end. Over 39,000 cubic metres of concrete was placed for the spillway floor and wall lining. The excavated spoil (rock and soil) from the auxiliary spillway excavation was removed by large off-road haulage vehicles, transported across the dam and placed on land on the western (left) side of the dam. The disposal site had erosion control measures and was progressively landscaped and revegetated using native species. Construction of the auxiliary spillway involved removing much of the overhead cableway across the Warragamba Gorge - specifically the head tower and lower tail tower, which was located directly in the path of the spillway and spoil haulage road. The cableway played a unique and significant role in building the original Warragamba Dam and a number of initiatives were undertaken to preserve its heritage significance. The heritage significance of all items affected by the project was fully documented, including comprehensive photographic records. A number of these heritage items are now featured in the Warragamba Water for Life exhibition and in interpretive signage around the site. Map of Warragamba Dam and local Warragamba township plus location attractions.